Companies continue to increase their content marketing budgets in an effort to generate more leads and attract new customers. With increasing investment in content marketing it is even more important that the content you create gets to the right audience and you get the ROI from your efforts. Many companies create great content but fail miserably at content marketing. In most cases the reason for this is that they fail to get their content in front of their intended audience. Even with great SEO you need to take extra steps to make sure that you use the most effective content distribution and promotion tactics to ensure it is seen by the right people and shared by them too! Schedule promotion across appropriate channels - Make sure you post at the right times to be effective - do some research and experiment to figure out the best posting times for your audience. Analyze and report on the results - Learn and make adjustments for the campaign you are running as well as future ones. "Only 42% of marketers say they are able to measure their social activities. " This is the obvious one but we have a few tips! Social media is one of the most widely used ways of distributing and promoting content and it's highly effective at extending your reach. Make sure you have well defined Buyer Personas so that you know which social media channels to promote and post your content on for maximum impact! An attractive image or graphic (you can use a tool like Canva if you don't have any paid subscriptions to other tools or sites). When distributing content on social media take into account that different types of content suits different social media channels. What may resonate on LinkedIn may not do so well on Facebook. It's also important to note that there are different frequency recommendations for posting on different channels e.g. Twitter may be 8 times a day but Facebook may only be 2. Check out Buffers Social Media Frequency Guide for more details. So do your research and distribute and promote on the channels where your buyers are active at the times they are most likely to engage. Get the employee who wrote the content to tweet about from their Twitter account. Include social sharing on the Blog page, Landing Page etc. As we mentioned above, Images are very powerful and help people separate the "Tree from the Woods" . In fact Tweets with images generate 55% more leads than Tweets without images. With 76% of people using their Facebook feed to find interesting content (Source: HubSpot, 2016) it's a channel well worth looking at for your content promotion but this will of course depend on what your product or service offering is. Post the content a few times on the first week of promotion. Lots of companies underutilise Google+ but its a great channel to reach out to prospective buyers. Post a new offer on your company page and subsequent blogs about it there too. Google+ Communities provide a great way to get involved and expand your reach - Join a few of the groups that are most relevant to what you do or groups that businesses you are interested in working with are involved in. Take part in conversations and comment on other peoples comments and posts so that people can get to know you. Tips: When you share your blog posts in Google communities, be sure to include a short summary of your blog or content. Consider including question's to engage your reader's and as we mentioned earlier use well researched #hashtags to make sure your content reaches the right audience. In the past two years, content consumption on LinkedIn has increased 21%. (Source: HubSpot, 2016). If you want to use Groups, make sure you understand the rules for the group and consider just choosing a piece of content about once a week to promote within the group. Find a discussion that is related to your content. Post helpful comments including a link to your content in a 'very natural way' similar to how you would reference other peoples content. Using Social Media to distribute and promote your content is essential and so is having a tool to schedule your posts and analyse the results. Social monitoring is a must for a whole host of reasons. Make sure you have a well defined process in place to enable you to quickly monitor social media every day. Check out our guide to 'Monitoring Social Media in Just 10 Minutes a Day' if you need some help. Don't have an email subscribers list? Then set one up straight away! By giving the option to visitors to sign up for updates, it will help draw them back to your site time and time again. Set up an automatic email to notify your subscribers when a new blog post has been published or send them a Weekly or Monthly Newsletter with links to the best of your recent articles. Or do both - just don't spam them. Make sure you have an RSS feed for people to subscribe to (as some prefer this option) and that automatic emails are generated when you post a new blog. This is a great opportunity not to be missed. If your content is interesting and useful then people will subscribe to it and are likely to share your posts with others. Using these contact details you can nurture and follow up with these leads. Tip: Don't forget to have an easy opt-out mechanism in place for people so that they can unsubscribe. If you want to use email marketing then an automated tool is essential. Use them to store your subscriber lists, implement segmentation, set up email marketing campaigns, set up email templates, automate RSS feeds etc. These tools will provide a means to monitor and measure campaign results too which is vital if you want to know how effective your campaigns are and learn how to improve them. They will tell you how many people have opened emails, clicked through to links, who has opened emails etc. If you are using a good marketing automation platform like HubSpot, use this to automate your emails and track open rates, click through rates etc.. For smaller companies email marketing tools like MailChimp or AWeber are great alternatives for lower budgets. Publish high-quality valuable content suited to your LinkedIn audience. Connections in your own network can then share your valuable content with their network. Every time someone likes or comments on your post their first degree connections can see it. If you create content that is truly remarkable and of value to people, you have the chance of being recommended by LinkedIn Pulse which opens you up to a huge new audience. So what are you waiting for...either publish a full article or part of one with a 'Read more' or 'Continue reading' link to draw interested people back to your website. Influencers are a hot topic these days in the marketing world. One of the best ways to get your content in front of people is by having an influencer share it for you. So find good relevant influencers and start a conversation with them - ask them for some feedback or input, share some of your ideas for topics with them and get their opinions. Start building a lasting relationship with them before you ask them to help you share your content. This can take time so get started. Make sure your content is high quality so they will want to share it. It's a two way relationship so share their content too, add comments to their posts and interact with their content. When you build a relationship with them you can ask them for input or as industry experts a quote can be very valuable. There are some great 'community' sites which are great places for engaging with people. They consist of communities of people who are interested in discussing topics in their own fields as well as related fields. You can use these communities to engage and help people by answering questions, providing useful advice and in time moving them towards relevant content on your company website. Don't rush to share your content - give people time to get to know you and your business first. As always, remember to figure out what sites will be most suitable to become active on. Do some research or look at your buyer personas to see what community sites your competitors are using, what they are doing and how people are interacting with them to gauge the results they are getting. First piece of advice - Familiarize yourself with how Reddit works. Read and understand the rules before you start. Be warned! Get involved, contribute and become a familiar face before linking to your own content. Most people are familiar with Quora. Its a Q&A style platform. Look for questions around your industry and answer them, be helpful, and include links to your content like Blog Posts or Web Pages for further advice. Get yourself known on this platform - it could be very useful! There are many publishing platforms available. Medium is one of the most popular ones. One we use ourselves for both publishing our own content and for looking for information when carrying out research. If you have some content that you believe will resonate well outside of your current networks and reach, then consider using paid ads. You can use paid advertising options such as AdWords, Facebook, LinkedIn, Twitter as well as services like QuuuPromote which helps promote your content to influencers so that they share your content on social media helping you increase your reach. Some more expensive than others but you can test them out, see what the response is like and refine your campaigns. You may well decide one is not working at all and stop it completely. Make sure you set a budget, clearly defined goals as well as defining your target audience. If you decide to use paid distribution tactics, make sure you monitor, measure, tweak, monitor, measure, tweak .... Include A/B (split) testing to help identify what converts best. Make sure to include tweaking audience demographics as well as the ad itself but only change one thing at a time so that you know what change impacted results and whether it had a positive or a negative impact. Learn from each campaign, document what worked and what didn't and use this going forward for future campaigns. Guest posting is a great way to reach a new audience if done properly. Find credible sites related to your field with a strong audience. Then write interesting, unique content that will get peoples attention so much so that your audience and the company or person who owns the website itself they will look for more from you. But remember this is NOT a link building exercise so don't approach it that why. The goal here is to build authority and get people coming back for more - preferably to your own blog. Syndication is like guest blogging. You give a large site access to your content in the hope of engaging a larger audience than you have on your company blog. Drive traffic back to your own site by linking back to the original post and other relevant content. There are some paid sharing sites which allow you to submit content that they will get people share for a small fee. One of these is QuuuPromote. 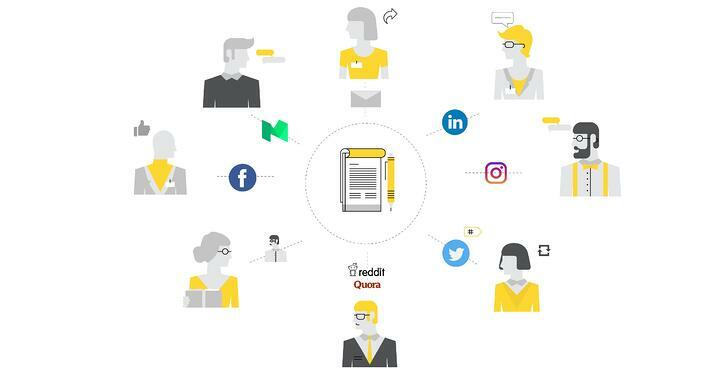 Quuu Promote will promote your content without appearing as an ad or sponsored post. It's shared by real people across real accounts. So for example you can pay $10 to reach 10,000 people across certain categories like Agriculture, Basketball etc, or $30 to reach 100,000 people in sectors such as AdWords, Affiliate Marketing, AI, Big Data etc. This is an option and worth testing out, but be sure to monitor the results to see if you are getting qualified traffic as a result. if you are using email a lot for business pick one of your best pieces of content and add it to your email signature. This is a great way to promote your content. Do NOT forget your employees! Employees are a great way to extend your reach. Ask them to share content that they think may be useful to people on their own networks like LinkedIn, Facebook, Twitter etc. Whatever distribution and promotion strategies you employ, you need to allocate time and resources to measure the engagement and ROI. By doing this you will learn where best to place your efforts and cut out expense or reallocate resources if a distribution channel simply isn't working. If you don't measure results and make changes based on those insights you may be throwing money down the drain. Do remember though that whatever content promotion strategies and tactics you choose, if your content isn't high quality, useful and tailored to your buyer personas (and the phase they are at in the buyers journey) then no distribution or promotion strategy is going to fix that. Remember ...'Engage with the right people, in the right companies at the right time'. If you would like to discuss your current content promotion tactics or any of the ones above please feel to contact me on sinead@webjourney.ie. If you are using Social Media as a content promotion strategy then make sure you have a good monitoring process in place. 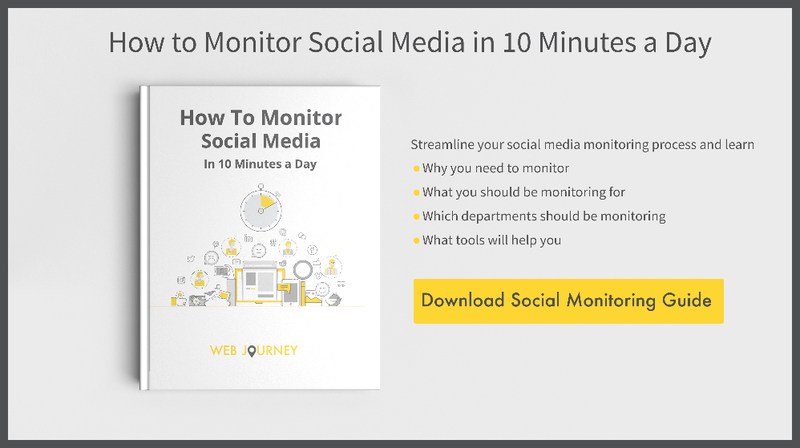 If you need some guidance on how to do this efficiently then download our guide below and learn how to monitor social media in just 10 minutes a day.